The Liberal Party is expected to become the largest party after the March 15 elections. We expect that a centre-right coalition will emerge after lengthy negotiations, giving Mark Rutte his third term as PM. The chances that Geert Wilders will participate in the next government are small as all other major parties have ruled out working with him. The Dutch economy is holding firm against the backdrop of heightened political uncertainty at home and elsewhere in Europe. Being the first of a number of European countries with elections this year, all eyes are on the Netherlands this week. This year’s Dutch elections are characterized by an unusual degree of fragmentation, even by Dutch standards, with no less than 28 parties on the ballot. With most parties having ruled out the option of working together with the right-wing Geert Wilders, the coalition-building process is likely to be lengthy. The post-war Dutch society was strongly characterized by pillarization, which is the segregation of society into groups based on religious or social-economic basis. This extended itself into politics, where people would vote for the party reflecting their religious or ideological affiliation. It was not before the late 1960s that this system of pillarization gradually eroded on the back of growing welfare and rising individualism. Voters gradually became more fluid and more demanding. The first party to benefit from this on a large scale was D66, which was formed in 1966 by a group of politically unaligned intellectuals, led by Hans van Mierlo. Their primary aim was to democratize the political system. It received seven seats in the Lower House during its first elections in 1967. Since then, D66 has seen highs and lows, but is polling reasonably well in this year’s elections. The early 2000s was another watershed period for Dutch politics. It was marked by a strong populist insurgency in Dutch politics. Pim Fortuyn, who was assassinated weeks before the election in 2002, became the first right-wing populist running on an openly anti-immigration, anti-Islam platform. His party, the Lijst Pim Fortuyn (LPF) became the second-largest party in the 2002 election with 26 seats in the Lower House - a record in the Netherlands for a new party - and entered government in the same year. But without its charismatic leader, the party quickly crumbled because of internal struggles. By 2006, a right-wing successor of Fortuyn had emerged in the person of Geert Wilders, who founded the Party for Freedom (PVV). The PVV immediately won nine seats in the 2006 general election, making it the fifth-largest party in parliament. PVV became the third-largest party in the 2010 election after it won 24 seats. It briefly supported a minority government led by the Liberal Party (VVD) without having ministers in the cabinet. However, it withdrew its support in April 2012 due to differences over budget cuts. After elections were held the same year, the current coalition consisting of the Labour Party (PvdA) and the VVD was formed. The Netherlands is holding parliamentary elections on March 15. The wider ramification of the Dutch elections is that some analysts expect that a victory by Geert Wilders could give the election campaigns of populist parties in France and Germany momentum. With many parties in the running, the threshold for any party to get one seat in parliament is much lower than in Belgium or Germany: 0.67% compared to 5%. If we would go by current polls, fourteen parties will make it to the Lower House. The 2012 election result was heavily influenced by strategic voters who at the very last moment opted for either the centre-right VVD or the centre-left PvdA. Ironically, both parties ended up forming a government together. This year’s election is characterized by a much more diverse political landscape. The VVD of current PM Mark Rutte is the largest party in the polls, with 16% of the vote (Figure 1). Geert Wilders’ Party for Freedom (PVV) is polling second, with 15% of the vote. At some distance from the PVV and VVD are a number of parties that are polling each between 8% and 12% of the vote. These parties are the Christian Democrats (12%), D66 (12%), Green Left (10%), the Socialist Party (10%) and the PvdA (8%). With only days to go until election day, it is very unlikely that current polls will change drastically. There is only one major TV debate left on March 14 between the party leaders from the fourteen major parties. With Brexit and the election of Trump fresh in memory, some analysts may be worried that the polls do not accurately capture the populist vote. We expect Dutch polls to paint a fairly accurate picture of the support for Geert Wilders. The PVV has been in politics for over a decade and pollsters have built up a good deal of experience in predicting the populist vote. If the PVV would become the largest party in a surprise victory, its chances of entering government are small given that all parties except two smaller parties – Elderly Party (50Plus) and the Reformed Party (SGP) – have said not to collaborate with Geert Wilders. A victory by PVV could, however, give momentum to the election campaigns of populist parties elsewhere in Europe. Whereas the 2012 elections were dominated by economic issues (the Dutch economy was in deep recession at the time), the upcoming elections are much more centered around social issues such as identity, cultural values and assimilation of Muslim immigrants. Wilders wants to implement a complete stop to immigration from Muslim countries. He is also campaigning on an anti-EU agenda and wants to call a referendum on EU membership. VVD is a pro-European party with much more modest ideas about immigration, though party leader and current PM Mark Rutte is partly using the same rhetoric as Geert Wilders in an attempt to not alienate right-wing voters. The VVD is running on an economic conservative agenda, advocating for instance further labour market reforms, tax cuts for businesses and households and €1bn of extra defence spending. The most immediate implication of current polling results is that the next government needs to consist of at least four parties to get a majority in the Lower House of parliament. Traditionally the party that wins the election gets the initiative to form a coalition. 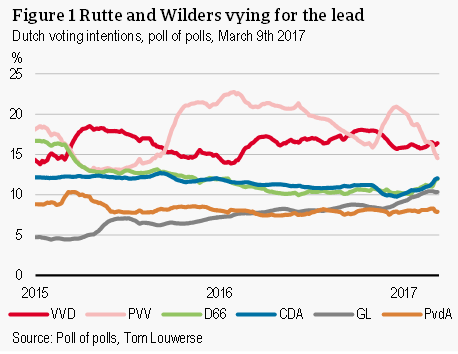 Our base scenario is that the VVD will maintain its lead over the PVV, giving current PM Mark Rutte the lead over the process of forming a government. We expect that the VVD succeeds in building a centre-right coalition with three or four other parties. If the negotiations led by VVD would somehow break down, a coalition over the left flank is the most likely outcome. Figure 2 gives a number of possible coalitions. Given the number of parties that are needed for a majority, we expect a lengthy formation process after March 15 elections. We consider a scenario in which the PVV enters government to be unlikely. Virtually all parties of substantial size have said they will refuse to cooperate with Geert Wilders. Even in the unlikely event that Wilders would be governing, the political system is stacked against a referendum on EU membership. First of all, holding a referendum on EU membership requires a majority in both the Lower House and Upper House of parliament, which it is unlikely to get as only the PVV and a number of smaller parties support such a referendum. If a referendum would somehow be called, a Dutch exit from the EU would probably not get a majority vote. According to pollster Ipsos, 64% of Dutch voters would vote against an exit from the EU. With two highly-unexpected events last year – Brexit and the election of Donald Trump – investors are clearly on edge. Over the past weeks there was a clear rise in sovereign yield spreads in France and Italy, which is likely to be related to the upcoming elections in these countries. On the other hand, investors seem to be less worried about the election outcome in the Netherlands. The Dutch yield has hardly increased vis-à-vis the German bund. What clearly separates the Netherlands from its southern counterparts is that the economy is in much better shape. GDP growth in the Netherlands has been outperforming that of the eurozone last year. The unemployment rate has declined substantially over the past three years and is reasonably low at 5.3%. Business and consumer confidence in the Netherlands has been in an upswing. 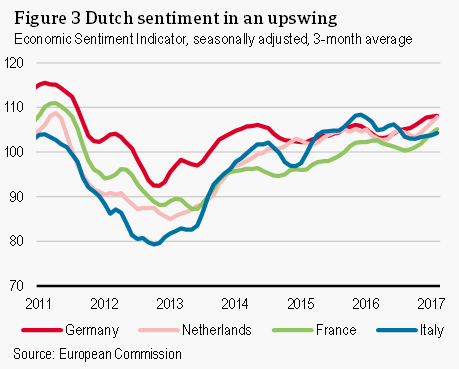 The seasonally adjusted Economic Sentiment Indicator (ESI) of the Netherlands stood at 109 in February 2017, the highest level reached since March 2011. The Dutch economy has generated sufficient momentum to be able to shrug off the risk of higher political uncertainty. At the time of the previous election the economic situation was much different. The Netherlands was in a deep recession. House prices fell by over 20% between September 2008 and mid-2013. Furthermore, austerity measures of a total of EUR 50 billion were announced in the period 2010-2013. Since mid-2013 the economy has begun to gradually recover. House prices have risen by 15% since their previous low. Due to the austerity measures and economic growth the Netherlands is expected to have a budget surplus of 0.2%-GDP in 2017 and 0.3%-GDP in 2018 according to the European Commission. Most political parties plan for tax cuts and higher spending on health care, education and pensions. The 2017 Dutch political landscape is highly fragmented, setting an uncertain scene for the first national political test of the year in Europe. 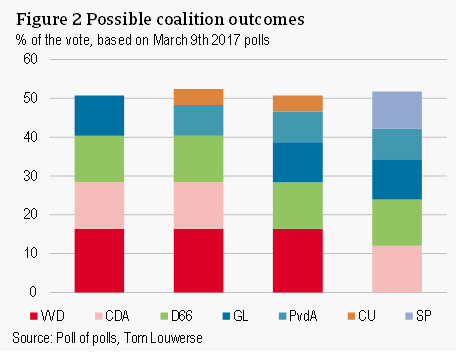 We predict that another populist victory is unlikely and that the Liberal Party (VVD) of current PM Mark Rutte will become the largest party. A centre-right government consisting of four or five parties will most likely be formed. Even if the right-wing PVV wins the majority of the vote, the chance that they will end up in the next government is very small since all major parties said that they refuse to collaborate with Geert Wilders. A win by Wilders could, however, give further impetus to the election campaigns of populists elsewhere in Europe.